So I’ve been slaving and muddling along with mouse’s systems the last few days and trying to make things as modular and customize-able as possible so that it can be easily manipulated as needed. 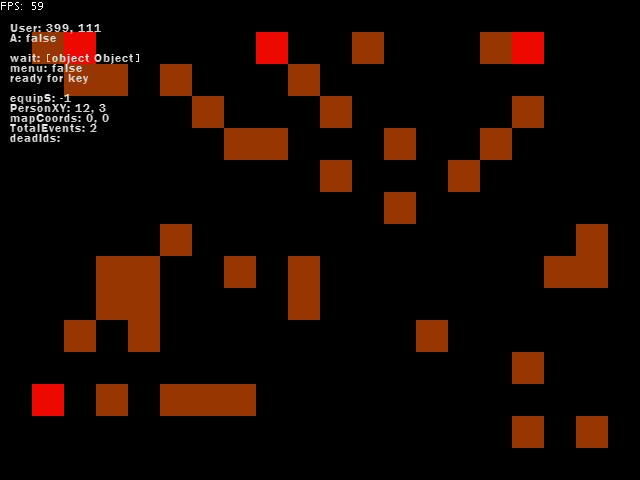 Now, as you can see it’s a very vague and basic menu system, but everything in it can be easily changed. The X&Y coordinates can be moved anywhere on the screen, the controls can be altered exceptionally easily. 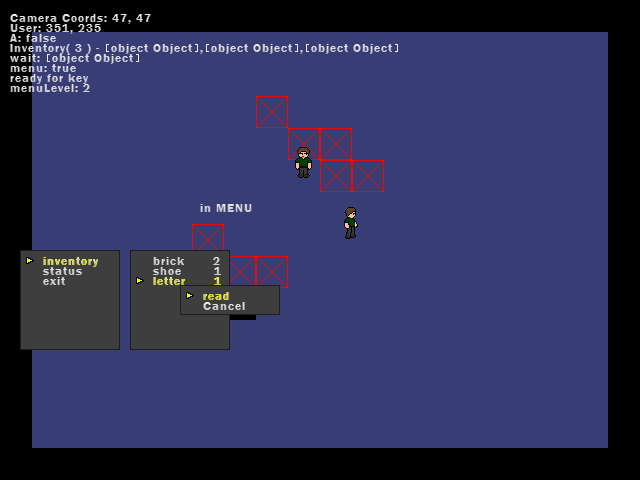 As you can see, the brick (dummy item) is being selected, and there are four options. Now, I’ve given the brick multiple tags and with those tags, options are generated to what the user can do with that item. Now, I’ve labelled the letter as a special item, so the discard option is not available as it was with the brick. Now I’ve got to integrate a view other nuances with the controls of the menu and make it a bit smoother and bit more practical. After I’ve explored and filtered out some more menu actions, I’ll move over to NPC interactions, mainly choices, dialogues and depending on if the user is holding certain items, they’ll interact differently and say differing messages. Lots of the plate this week! I’ve been away for work so I haven’t been able to hit the ground running on more technical milestones regarding mouse. 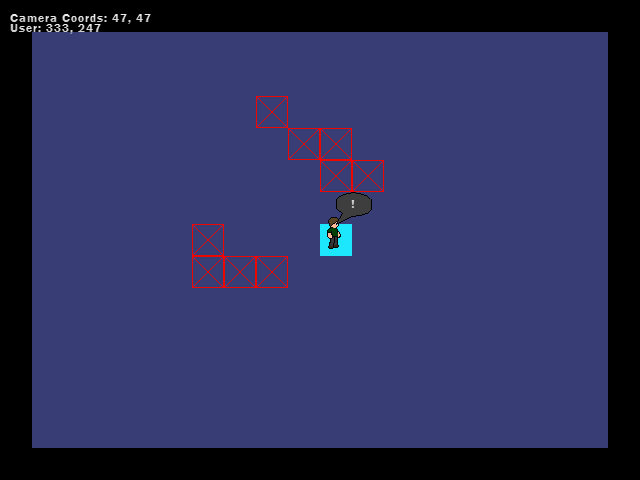 Currently I’m re-wiring the message dynamics for the game to be a bit more robust and tailored to the game’s needs. I’m also at the moment debating on the overall design of the menu system. First, however I must decide all the necessary elements that would be needed, for example, saving & exiting the game are a must. The item section in some iteration is a must (whether it’s a cloud of all available items or more structure (consumables, key items, quest). 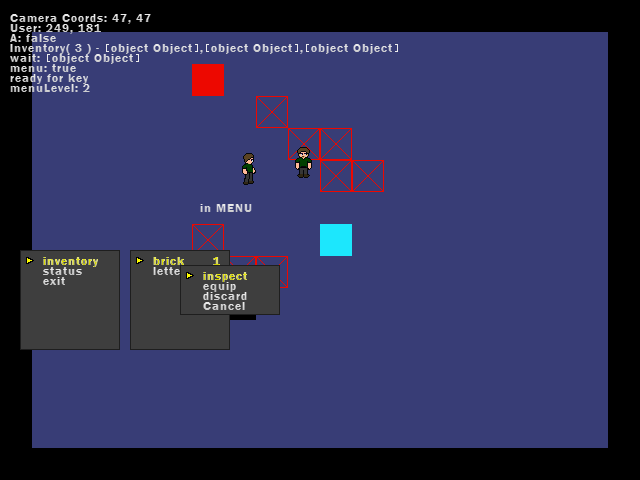 Once the overall direction of the game is decided, the menu can take shape. 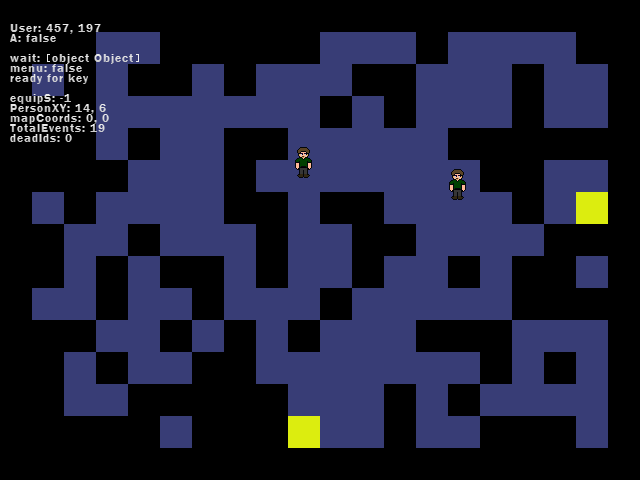 In particular, I’m currently working on picking up items and being able to place them in locations, some locations being strict in what it can accept, to the field, where it can be placed freely. Sorry, no screenies this time around… soon though. It was a tad bit of shock this afternoon when I fired up the old blog. I checked and to my surprise, I found 12 pending comments to sift through. Usually they are legit because from what I’ve noticed, wordPress does a pretty good job of filtering spam for the most part. Unfortunately, they went 0 for 12. Good, fun time, spam. Anyways, purpose of this post was to show you something I haven’t done in at least a couple of years (I’m too lazy to officially check), and that is to show you a terrible screenshot of mouse. Ha. 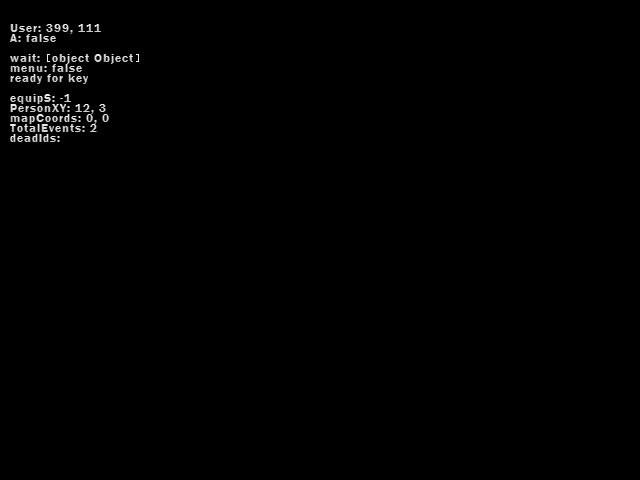 Anyways, as you can see, this is a test environment and I’m currently re-learning a lot of scripting nuances about the MapEngine as I haven’t toyed with it in a few years. My end goal is to create all of the systems and presumably all the cases of interaction and game play. After I’m able to complete these, the rest of the game can come together and by god, progress can finally be made. Can you tell I’ve had some free time? I have been working diligently on trying to pump out a 2.0 release of Traders, although it is nearly completion, it just is not quite ready yet. I`m still heavily in the testing phase and cleaning up a lot of the code and to remove any debug/test zones from the game’s core engine. I’m a bit torn in the decision in whether to fully incorporate knights and the barbarian attack. For the most part I’ve got the knights to work, they can chase the robber away and move up and down trade path. Although the latter still requires a bunch of testing, it works fairly neatly. I have yet to start on the actual barbarian attack, so I believe I’ll be leaving that portion of it out the 2.0 release (unless I get super crazy). In the coming days I’ll be capping off the knight moving, finalizing it and testing it through and through, and the plan is to add in city walls as the next feature. Once that is completed, I’ll be finishing any other animations/helpers that I’ve been missing/planned to do, then it’s clean up, and boom! 2.0 release! I popped my head into the theatre to watch the new Star Wars spin off movie and my verdict is that I’m indifferent. Don’t get me wrong, it is a great movie, very well done and I enjoyed it a ton. It tied a few things together and then at the same time it opened up some more stories at the same time. 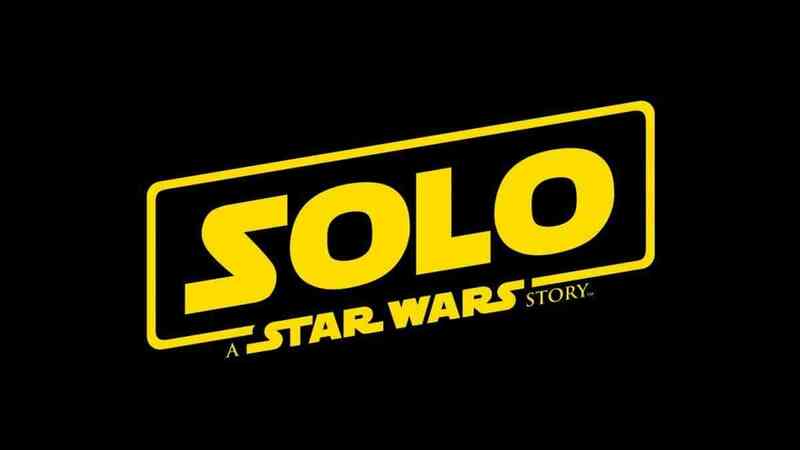 I had a hard time getting past the fact that Harrison Ford was not Han Solo, it was just wasn’t fully convincing it could be the same character. I need to venture off and see it again, but overall it was a good movie.